I personally Guarantee that my DVD, Healthy Lower Back Secrets will put an End to your Lower Back Pain Once and for All or your Money Back! 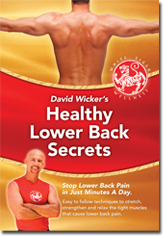 My name is David Wicker, the founder of White Tiger Wellness and this is the story of how I put together the most effective low back pain relieving exercises on DVD to stop lower back discomfort in its tracks. If your lower back discomfort is not severe and you are not suffering or hurt from an acute lower back injury and are otherwise in good health then follow along with this video clip below. If these exercises cannot be done with ease then tight hips are most likely contributing or even causing your low back issues and preventing recovery. Many people fear that the ache in their lower back is caused by some sort of disease like appendicitis, kidney disease, kidney infection, bladder infection, pelvic infection, aneurysms, osteoarthritis, osteoporosis, scoliosis, degenerative disk disease, fibromyalgia, or skeletal disease in the spine. But for most people out there with chronic low back pain and no clear diagnosis the actual cause of their lower back strain is simply the tight muscles around the hips that attach to the lower back. This also produces lower back pain symptoms such as a low back pinch, or a lower back spasm and can even lead to disk herniation otherwise known as a bulging disk in the lumbar area of the spine region. This happens because the muscles in and around your hips; such as the glutes, IT band, hip flexors, hamstrings, psoas, etc. are shortening whenever you are sitting; sitting in your car, sitting in front of your computer, or sitting in front of your television set. As these muscles shorten they begin to pull on the point of attachment causing strain in the lower back, hips, legs or rear end. What most people don’t realize is that by stretching their hips they can often eliminate back pain completely and make a full recovery! This is just a small sample of how the DVD, Healthy Lower Back Secrets guides you step by step through a comprehensive three part program to help you fix your lower back pain. Part one will create spinal flexibility and generate blood flow to your hips and back as the perfect warm up. Part two will lengthen the tight muscles on the outside of your hips - as you saw in the video clip above. And Part three will lengthen the muscles on the inside of the hips as well as strengthen the muscles of your core; the stomach, obliques, and entire midsection not unlike Pilates or Yoga exercises which will also flatten and tone your stomach at the same time. These lower back pain relieving exercises will not only reduce back pain, but stop back pain, and even fix back pain for good by releasing the tight muscles around the hips that attach to the lower back, including the glutes, hamstrings, calves, IT band, hip flexors, piriformis (syndrome), and the sciatic nerve that causes sciatica. This DVD will also strengthen and tone the weak muscles of the stomach, obliques and base of the spine to help support a healthy lower back. 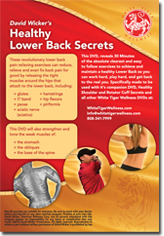 The DVD, Healthy Lower Back Secrets by White Tiger Wellness Guru David Wicker goes beyond rehab from physical therapy to reveal 30 Minutes of the absolute clearest and easy to follow exercises to achieve and maintain a happy and healthy Lower Back for golf, tennis, weight lifting, swimming, baseball, football and daily life. Specifically made to be used with it's companion DVD Healthy Shoulder and Rotator Cuff Secrets. Money Back Guarantee. * I also noticed that most people with Lower Back issues are also suffering from tight muscles in the upper back area around the shoulder blades and rotator cuff (shoulder joint) so I created a separate companion DVD called Healthy Shoulder and Rotator Cuff Secrets which I recommend that you purchase in addition to Healthy Lower Back Secrets. Click here to preview. These three parts work together to bring you the absolute best lower back pain relief DVD available anywhere in the world. I guarantee that you will feel profound results the first time you try it - or return it for a free refund! The method on this DVD is both a rehab treatment similar to physical therapy as well as a method of prevention to prevent low back muscle strain in the first place. This method can be the missing link to other back pain management treatments such as heat & ice therapy, acupuncture, chiropractic and a key to avoiding back surgery. These lower back pain relieving exercises will not only reduce back pain, but stop back pain, and even fix back pain for good by releasing the tight muscles around the hips that attach to the lower back, including the glutes, hamstrings, calves, IT band, hip flexors, piriformis (syndrome), and the sciatic nerve that causes sciatica. This DVD will also strengthen and tone the weak muscles of the stomach, obliques and base of the spine to help support a healthy lower back. The DVD, Healthy Lower Back Secrets by White Tiger Wellness Guru David Wicker goes beyond rehab from physical therapy to reveal 30 Minutes of the absolute clearest and easy to follow exercises to achieve and maintain a happy and healthy Lower Back for golf, tennis, weight lifting, swimming, baseball, football and daily life. 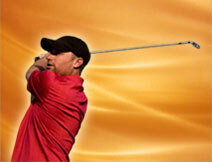 Specifically made to be used with its companion DVD Healthy Shoulder and Rotator Cuff Secrets. Money Back Guarantee. 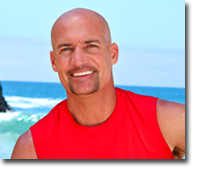 David Wicker is a licensed and certified personal trainer. He’s been endorsed by doctors, surgeons, therapists, and sports trainers. David has instructed over a quarter million students and created Wellness Centers for resorts across Hawaii, California and Arizona. 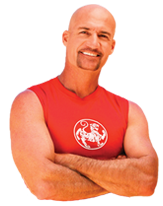 He is the founder of White Tiger Yoga and producer of the best selling White Tiger Wellness DVDs. I spent a half hour on the beach taking your class, and I stood up a new man. It was miraculous. I couldn't stop grinning, because I felt as if a great and painful weight had been lifted from me. That day I bought four of your DVDs and joined my family in snorkeling. Two days later I played 18 holes of golf..... I humbly thank you for what has truly been the gift of a miracle. Aloha!"